One of Deadpool's defining traits is that he's a superhero who knows he's in a comic book. 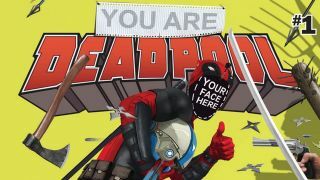 Breaking the fourth wall is one of Wade Wilson's favorite antics, right up there alongside killing bad guys, eating chimichangas, and perverse sexual acts I couldn't possibly begin to describe on a relatively family-friendly site such as this. And this May, you get to experience that same power. While some decisions are purely binary and thus give the book a bit of a "choose your own adventure" vibe like you're back in 3rd grade again (don't tell me you never read Beware of the Purple Peanut Butter from the Give Yourself Goosebumps book series), there will be more and more game-like elements as the series continues. For example, you'll want to keep some dice handy as you read, because it can determine whether Deadpool wins or loses in that timeless staple of video games, the boss fight. You'll also be able to steal items from the pages and place them in your 'inventory,' play mini-games that revolve around bar fights and beat poetry. There's even the obligatory stealth section. Although each issue will be largely self-contained, your inventory and some choices persist throughout the series. Think of it kind of like a Dungeons & Dragons campaign, with the comic serving as your Dungeon Master. Or would that be Dungeons & Deadpool, with the comic acting as a Deadpool Master? In any case, it sounds amazing, and may indeed be the closest fans come to being Deadpool. Look for You Are Deadpool #1 in May.